I have been using Follow Your Heart Vegenaise for quite some time now and I can’t believe I hadn’t done a Healthy Swap on this. Shame on me because once I tried it I loved it and have not used any other mayonnaise since. I love mayonnaise. As a child my favorite ingredient in my bologna, cheese, ham, turkey, sandwiches or tortas was the mayo. A little extra always made me happy. I mean each corner of the bread needed to be touched by the magic of mayo. Any other food with mayo was my favorite as well like potato salads, coleslaws, tuna, pasta salads, and even dips. I am not sure where this love came from for mayo but it was a staple in our household growing up and we all loved it. I must clarify that it had to be Best Foods Mayonnaise. It is the mayonnaise I grew up eating and the only one we used at home. I don’t know what it was about Best Foods Mayonnaise but we had tried others and did not like them. Once I started to transition into a healthier eating lifestyle I wanted to find a healthier option and I found it with Follow Your Heart Vegenaise. I was skeptical at first because I was so used to the flavor of Best Foods that I really wasn’t sure if I was going to like this healthier option. To my surprise I really loved it. It was love at first taste. It tastes like mayo and a pretty good one too. I have been using it ever since and have not looked back or missed Best Foods mayonnaise. Follow Your Heart Vegenaise is vegan therefore it has no eggs which makes it a little healthier if you are watching your calories and weight. Expeller-Pressed Canola Oil, Filtered Water, Brown Rice Syrup, Apple Cider Vinegar, Soy Protein, Sea Salt, Mustard Flour, Lemon Juice from Concentrate. Soybean Oil, Whole eggs and Egg Yolks, Vinegar, Sugar, Lemon Juice, Calcium Disodium EDTA (used to protect quality), Natural Flavors. One ingredient in Best Foods Mayonnaise caught my attention and is Calcium Disodium EDTA. I did my research and found out that this ingredient is a concoction of poisons and chelation chemicals. It is often used as a drug to stop lead poisoning or to treat someone exposed to radioactivity. It helps your body expel heavy metals. It is used in foods to prevent air from spoiling it and it is toxic to humans in large amounts. The ingredients in Original Vegenaise are simply that ingredients from food. No chemicals or additives to make it last longer or to prevent it from spoiling. When you find it in your grocery stores you will notice it is in the refrigerated section. 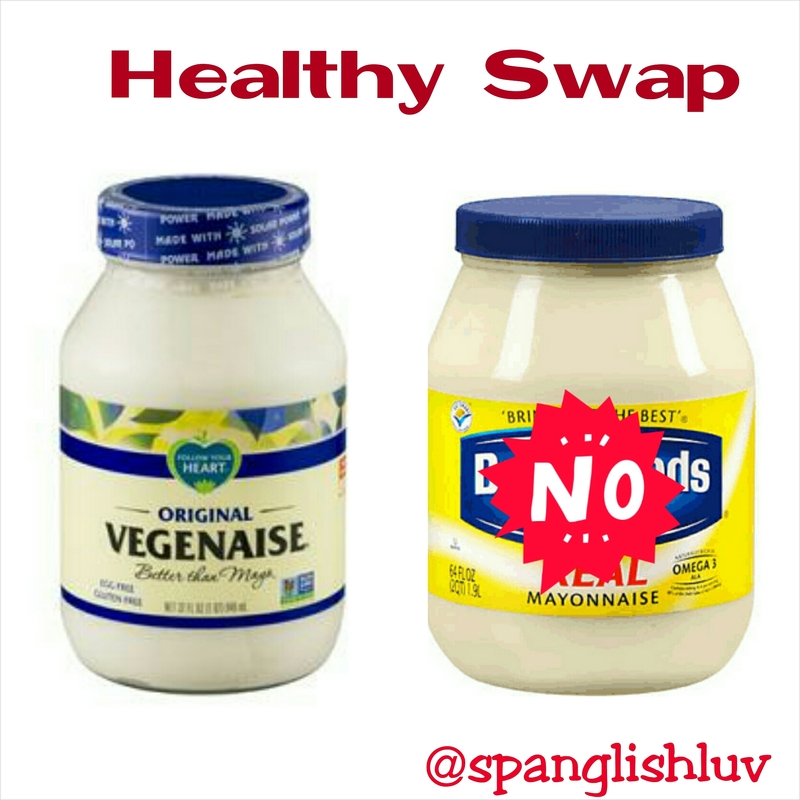 Original Vegenaise– 90 calories, 9g total fat, 0.5g saturated fat, and 85mg of sodium. Best Foods Mayonnaise– 90 calories, 10g total fat, 1.5g saturated fat, and 90g of sodium. If you are looking for something that is better quality, better ingredients, healthier, and animal free product then Follow Your Heart Vegenaise is your choice. I really do recommend it as a mayonnaise enthusiast it makes me feel better knowing that I am eating something that is much more healthier for me and my family. It can easily be substituted in your pasta salads, tuna salads, dressing, dips, or any food that you would use mayonnaise in. Hope you give Follow Your Heart Vegenaise a try. Follow Your Heart also carries many other flavored mayonnaise and salad dressing as well. Great food product that I highly recommend. He estado usando Follow Your Heart Vegenaise desde hace bastante tiempo y no puedo creer que no había hecho un Swap Saludable de este producto. Una vez que probé esta mayonesa me encantó y no he utilizado otra mayonesa desde entonces. A mí me encanta la mayonesa. Cuando era niña mi ingrediente favorito en mis sándwiches o tortas de bologna, queso, jamón o pavo era la mayonesa. Y siempre con un poquito extra de mayonesa, me refiero a que cada rincón del pan fuese tocado por mayonesa. Cualquier otra comida con mayonesa era mi favorito también, así como ensaladas de papa, coleslaws, atún, ensaladas de pasta y salsas e incluso. No estoy segura como surgió el amor a la mayonesa, pero era un producto que no faltaba en nuestro hogar. Debo aclarar que tenía que ser la mayonesa Best Foods. Es la mayonesa con la que crecí comiendo y la única que usábamos en casa. Una vez que empecé a cambiar mi estilo de vida a uno más saludable quería encontrar una mayonesa más saludable y la encontré en Follow Your Heart Vegenaise. Estaba un poco escéptica porque estaba tan acostumbrada al sabor de la mayonesa Best Foods que realmente no estaba segura de si me iba a gustar esta opción más saludable pero para mi sorpresa, realmente me encantó. Fue amor a primera probada. Es muy rica y la he usado desde ya hace tiempo y no he mirado hacia atrás. Vegenaise es vegana, por lo tanto, no tiene huevos ni producto de animales que le hace un poco más sano si estás cuidando tus calorías y peso. Aceite de Canola pulsado, agua filtrada, jarabe de arroz integral, vinagre de manzana, proteína de soja, sal marina, harina de mostaza, jugo de limón de concentrado. Aceite de soja, huevos enteros y yemas de huevo, vinagre, azúcar, jugo de limón, calcio disódico EDTA (utilizado para proteger la calidad), sabores naturales. Un ingrediente encontrado en la mayonesa Best Foods me llamó la atención y es calcio disódico EDTA. Al investigar y leer sobre este ingrediente descubrí que este ingrediente es una mezcla de venenos y productos químicos de quelación. A menudo se utiliza como un fármaco para detener el envenenamiento por plomo o para tratar a alguien expuestos a la radiactividad. Ayuda a su cuerpo a expulsar los metales pesados. Se utiliza en los alimentos para evitar que el aire eche a perder los alimentos y es tóxico para los seres humanos en grandes cantidades. Los ingredientes en Follow Your Heart Vegenaise son simplemente eso, ingredientes de alimentos. No hay productos químicos o aditivos para hacer que dure más tiempo o para evitar que se eche a perder. Encontraran Follow Your Heart Vegenaise en sus tiendas en la sección refrigerada. Follow Your Heart Vegenaise– 90 calorías, 9g grasa totales, 0.5g de grasa saturada y 85mg de sodio. Best Foods Mayonnaise– 90 calorías, 10g grasa totales, 1.5g de grasa saturada y 90mg de sodio. Si usted está buscando algo que es de mejor calidad, mejores ingredientes, más saludable y libre de productos de animales les recomiendo Follow Your Heart Vegenaise. Yo realmente la recomiendo como un entusiasta de la mayonesa y que me hace sentir mejor al saber que estoy comiendo algo que es mucho más saludable para mí y mi familia. Puede ser fácilmente sustituido en sus ensaladas de pasta, ensaladas de atún o cualquier otra comida que lleve mayonesa. Follow Your Heart también produce otros productos como aderezos y varios diferentes sabores de mayonesas. Les recomiendo este producto, yo soy una fan leal. My daughter has become my second pair of eyes at grocery stores which makes her the best grocery shopping partner. I love the fact that she notices items that I don’t and that she gets excited in trying new things. She was the one that spotted Dr. Praeger’s Kids Lightly Breaded Fishies at Wholefoods Market. I think that what caught her attention first was the fact that Dora the Explorer was on the box but that was just a plus because when I read the ingredients I was convinced these were a great alternative to all the popular brands out there of breaded fish. I did let her know that they were breaded fish not chicken because she didn’t really know what they were, like I said she just saw Dora the Explorer and aimed at them but she wanted to try them. When we opened the package at home we noticed that they were lightly breaded just as the package states, fun shapes for the kids, and they smelled really good. Once baked they turned nice and golden and not greasy at all. My daughter ended up loving them. I tasted one myself and I liked the fact that they were not salty or greasy. We greatly recommend Dr. Praeger’s Lightly Breaded Fishies. These fishies are 90 calories, 40 from fat, 4g total fat, 1g of sugars, and only 210 mg of sodium. A great alternative as oppose to a popular brand of fish sticks like, Gorton’s Fish Sticks which have 210 calories, 100 from fat, 11g total fat, 3g of sugars, and 310 mg of sodium. A big difference in the numbers not to mention the ingredients. The ingredients in Dr. Praeger’s Lightly Breaded Fishies are simple and understandable for example minced Alaskan pollock, unbleached flour, salt, garlic powder, onion powder, garlic and pepper just to mention a few. The ingredients in Gorton’s Fish Sticks read more like a chemistry project. For example: minced alaska pollock, enriched bleached wheat flour, niacin, thiamin mononitrate, cotton seed and/or soybean oil, sodium aluminum phosphate, natural flavor, tripolyphosphate, and TBHQ. TBHQ caught my attention because I had no idea what it was so I decided to read on it. It is a chemical preservative which is used in foods to delay the onset of rancidness and greatly extends the storage life of foods. Unfortunately the FDA does approve it but doesn’t necessarily make it safe. Consumed in large quantities it can cause nausea, delirium, and vomiting. Overall, we highly recommend Dr. Praeger’s Lightly Breaded Fishies because they are light, crispy, fun shapes, delicious, and not greasy fish sticks. I am sure your children will greatly enjoy them. We found them at Wholefoods Market but you can visit their website for a store locator near you. Mi hija se a convertido en mi segundo par de ojos en los supermercados porque ella suele encontrar productos que yo no necesariamente alcanzo a ver. Y le fascina comprar y probar nuevos productos de comida. En este caso ella fue la que miro estos pescados empanizados de Dr. Praeger’s. Aunque creo que lo que le llamo la atención primero fue que Dora la Exploradora estaba en el envuelto pero al verlos y leer los ingredientes sabía que era una buena compra para que mi niña los probará. Al abrirlos en casa me di cuenta que estaban levemente empanizados, estaban en figuras divertidas, olian rico y no se sentían grasosos. Y ya cocinados se veían y olían deliciosos y no estaban grasosos. A mi hija le fascinaron y a mi también porque no estan salados. Les recomendamos estos pescados empanizados, Dr. Praeger’s Lightly Breaded Fishies. Contienen soló 90 calorías, 40 calorías de grasa, 4g de grasa total, 1g de azúcares y 210 mg de sodio. Son una muy buena alternativa a pescados empanizados de marca popular como, Gorton’s Fish Sticks, que contienen 210 calorías, 100 calorías de grasa, 11g de grasa total, 3g de azúcares y 310 mg de sodio. Una gran diferencia en las cantidades de nutrición y esto sin mencionar los ingredientes. Los ingredientes de Dr. Paeger’s Lightly Breaded Fishies son simples y entendibles por ejemplo: Pescado Alaskan Pollock, harina sin blanquear, sal, ajo en polvo, cebolla en polvo, ajo y pimienta. Los ingredientes de Gorton’s Fish Sticks se leén mas como un experimento de química por ejemplo: Pescado de Alaskan Pollock, harina de trigo blanqueada enriquecida, niacina, mononitrato de tiamina, aceite de semilla de algodón/aceite de soja, fosfato de sodio y aluminio, sabores naturales, dextrosa, trypolyphosphate y TBHQ. TBHQ me llamo la atención porque la verdad no sabía que era así que me puse a investigar. Es un conservante químico que se usa en productos de comida para retrasar la aparición de rancidez y se extiende en gran medida la vida de almacenamiento de los alimentos. Es aprobado por el FDA (Administracion de Alimentos y Medicamentos) pero no necesariamente lo hace saludable. Consumido en grandes cantidades puede provocar nausea, delirio y vomito. Este es uno de algunos additivos agregrados que en mi opinion son inecesarios y peligrosos. Les recomendamos Dr. Praeger’s Lightly Breaded Fishies, porque son deliciosos, levemente empanizados, en formas divertidas para los niños, no estan salados y grasosos. Nosotras los encontramos en la tienda Wholefoods Market pero puedes visitar su pagina web para encontrar una tienda serca de ti. I have found a multi-purpose cleaner that is effective, great smelling, and more natural than all those other well known cleaners out there. Honest Multi-Surface Cleaner White Grapefruit has become my new favorite go-to cleaner. I like the fact that it is non-toxic, biodegradable, pH balanced (which means it is great if you are sensitive to harsh chemicals and for sensitive surfaces), and contains no harsh chemicals. I can use it to clean my kitchen counter tops, living room furniture, bedroom furniture, the bathroom counter tops, and pretty much any surface. The grapefruit smell is just divine; it is refreshing to smell something nice after you clean instead of inhaling harsh chemical smells left by other cleaners. 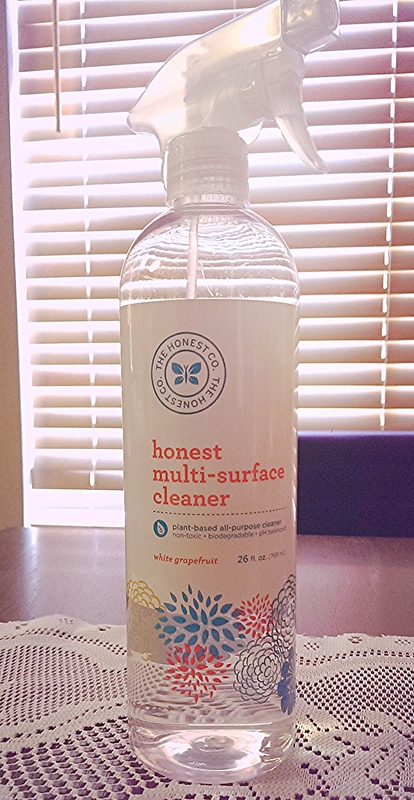 The Honest Company has many other cleaning products as well as baby, bath and body, health and wellness products. The great news is that not only can you purchase all of their lovely products online but you can find them at Target which is where I discovered this amazing product. I love it, I recommend it and it has become a must have product at my home. It is what I consider, Buen Producto! He encontrado un limpiador multiusos que es eficaz, con buen olor, y más natural que todos esos otros limpiadores que existen. El limpiador de Honest multiusos de olor a toronja se ha convertido en mi limpiador favortito. Me gusta el hecho de que no es tóxico, es biodegradable, pH equilibrado (lo que significa que es recomendable si usted es sensible a los productos químicos ásperos y para superficies sensibles) y no contiene químicos agresivos . Me encanta el hecho de que lo puedo usar para limpiar la cocina, muebles de sala, muebles del dormitorio, el baño, y cualquier otra superficie. El olor de toronja es simplemente divino; es refrescante oler algo agradable después de limpiar en lugar de inhalar olores de químicos fuertes dejado por otros productos de limpieza. Honest Company tiene muchos otros productos de limpieza, así como de bebé, baño y cuerpo, la salud y productos de bienestar. La buena noticia es que no solo puedes comprar estos productos por internert sino que también los puedes encontrar en Target que fue donde yo descubrí este maravilloso producto. Me encantó, lo recomiendo y se ha convertido en un producto de limpieza que no puede faltar en mi hogar. En mi opinion es un, ¡Buen Producto! The 21st of June is technically the first day of summer but the heat is here. With heat most likely if not careful we can suffer from heat exhaustion or dehydration. This is why it is important to keep ourselves cool and hydrated by drinking lots of water and coconut water. Yes, coconut water! 14 grams of sugar and not just table sugar it is a potent mix of heavily refined syrups. Contains more than twice as much sodium than potassium. Electrolytes-Yes it has them but since it contains more sodium than potassium it makes it an unlikely candidate for beneficial electrolyte restoration. When you are fatigue or exhausted the last thing you need is sodium (salt). Colorings, especially yellow #5 used in many tropical flavors. This coloring has been linked to asthmatic health issues. Gatorade used bromine brominated vegetable oil (BVO) used to increase fluidity and uniformity in its drink. It is also used to create lead dissolving additives for gasoline, photographic paper films, fire-extinguisher materials, and agricultural fumigants. More than 100 countries have outlawed the substance and it wasn’t until recently that Gatorade stopped using the ingredient. It has been replaced with sucrose acetate isobutyrate which is used to prevent separation of ingredients but it is also used as a weighing agent in printing inks, lacquers, and decorative coatings. Coconut water has less sugar than many sports drinks and much less sugar than sodas and some fruit juices. Less sodium and more potassium. It has natural electrolytes along with the added benefits of having no fat or cholesterol and not many calories. Natural nutrients that give energy and boosts good immune system. As you can see Gatorade is not good for us at all. Read the ingredients. It is a drink made of sodium (salt), sugar, and chemicals. The better option will be Coconut Water. When we start to feel very hot or thirsty lets reach out for a coconut water instead of those popular sports drinks that claim to help restore your electrolytes and crunch your thirst but at what cost? If you do decide to try coconut water, please, make sure it is 100% coconut water and doesn’t have any added sugars. I also personally prefer coconut water from Thailand, I have noticed that they are sweeter and much more better tasting. El 21 de Junio es el primer día de verano pero ya empezó el calor y tenemos que cuidarnos porque el calor ha llegado fuerte. El calor nos puede traer agotamiento y deshidratación por eso tenemos que mantenernos bien hidratados. Unas de las bebidas más populares para refrescarnos cuando hace calor es Gatorade. Pero sabías que es muy malo para nuestra salud por los ingredientes que contiene y que el agua de coco es una opción más saludable para refrescarnos y mantenernos hidratados. 14 gramos de azúcar ( y no solo es azúcar de mesa sino azúcar que esta muy refinada y potente.- Contiene jarabe de maíz alto en fructosa (high-fructose corn syrup). Este endulzante es fabricado no es natural y la razón por la que se hace es porque para las compañias es mucho más barato usarlo como alternativa a la azúcar natural. Es alto en fructosa (azúcar) y se le ha relacionado al diabetes tipo 2 y obesidad. Contiene más sodio que potasio. Y cuando te sientes agotado y acalorado lo último que necesitas es sodio (sal). Colorantes en especial amarillo #5 este colorante por lo regular es usado en los sabores tropicales y se le a relacionado a problemas del asma. Gatorade usaba un ingrediente llamado bromine brominated vegetable oil, este ingrediente es usado para disolver aditivos para la gasolina, extintor de incendios y pesticidas. En más de 10 países este ingrediente es prohibido. Sólo recientemente fue eliminado de la lista de sus ingredientes. Fue substituido por otro químico, sucrose acetate isobutyrate, que sirve para prevenir la separación de ingredientes. También es usado para espesar las tintas de impresión y barniz. Debido a su rico contenido en azúcares naturales da energia y mejora el desempeño intelectual y físico. Nutre y vuelve resistente el sistema inmune. Ayuda a combatir desnutrición y es un excelente hidratante en tiempos de calor. Un suero natural por excelencia. Contiene gran cantidad de sales minerales como cobre, zinc, hierro, ácido fólico y fósforo. El mineral que proporciona más de la mitad de la concentración del agua de coco es el potasio. Como veran la bebida Gatorade no es nada bueno para nosotros. Lean los ingredientes. Muchos de los ingredientes no son naturales. Y algo que no es natural no puede ser bueno para nosotros. Es una bebida compuesta de quimicos, sal y azúcar. Cuando sudamos ó nos encontramos deshidratados perdemos electrolitos y la mejor manera de recuperarlos es tomando agua de coco. Prueben el agua de coco. Asegurense de que sea 100% agua de coco y de preferencia que sea de Tailandia porque de todos los que he probado son los cocos mas dulces y saben deliciosos.